Early in 1885 Americans learned that General Grant was writing his Memoirs in a desperate race for time against an incurable cancer. Not generally known was the General's precarious personal fi-nances, made so by imprudent invest-ments, and his gallant effort to provide for his family by his writing. For six months newspaper readers followed the dramatic contest, and the hearts of Americans were touched by the General's last battle. 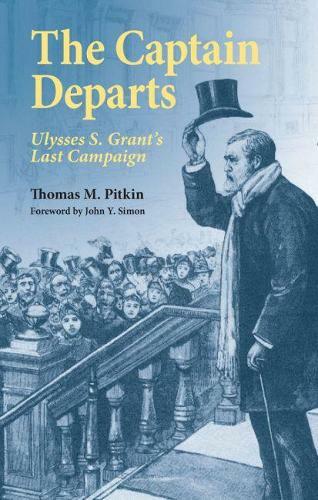 Grant's last year was one of both per-sonal and literary triumph in the midst of tragedy, as Thomas M. Pitkin shows in this memorable and inspiring book. The Memoirs was completed; its remarkable literary quality made it a triumph. Ultimately more than 300,000 sets of the two-volume work were sold. And Grant accepted the inevitable with quiet courage, and faded away in a manner sadly familiar to many American families. Though told without maudlin touches, the story of Grant's last year will leave few readers emotionally uninvolved, for it is an account of pain and suffering as well as mighty deeds, and truly deserves to be considered the General's final victory.